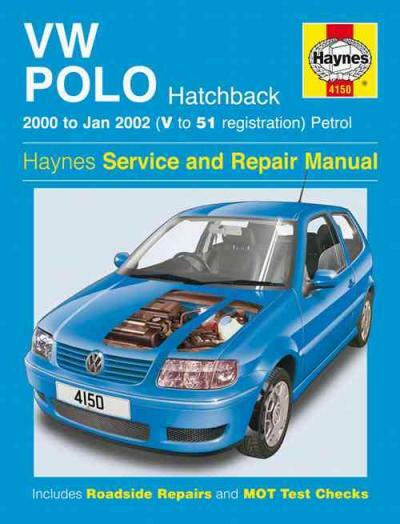 Volkswagen Polo Hatchback Petrol 2000 - 2002 Haynes Owners Service & Repair Manual (introduced Sept 2000 in Australia.) covers: Hatchback, including special/limited editions. 1.0 litre (999cc) OHC 4 cylinder petrol (AUC, ALD). 1.4 litre (1390cc) OHC 4 cylinder petrol (AKK, AKP, ANW, AUD). 1.4 litre (1390cc) DOHC 4 cylinder petrol (AFH, AFK, AHW, APE, AQQ, AUA, AUB). Does NOT cover GTi or sedan (Classic), wagon or Caddy commercial models. Does NOT cover `new` Polo range introduced January 2002 in the UK (August 2002 in Australia) that features new styling and circular headlights. The Volkswagen Polo Mk4 will be your fourth generation belonging to the Volkswagen Polo that is sold simply because of the German automaker Volkswagen from early 2002 to TWO THOUSAND AND NINE in all of the countries. It is really still being manufactured in South Africa, where it is always sold as you move Polo Vivo. The MK4 replaced the Volkswagen Polo Mk3 belonging to the supermini class. The Polo Vivo replaced the Citi Golf. The facelifted Mark III Phase Ii Clinical Trial (or Typ 6N2; sometimes described as the Mark IIIF or "Mark 5" by enthusiasts) was released in 2000. The hatchback models featured updated styling including new headlights and bumpers as well as an all new interior in accordance with that belonging to the Lupo. And also the car was similar to look at in direction of Mark III, Volkswagen claimed that 70% of the components were new. The bodyshell was fully galvanised and stiffened but aren't quite fully redesigned, although some panels were changed. Twin airbags were made standard. The saloon and estate versions received the fresh new interior, however it is not the full exterior facelift. Also, the 3-cylinder 1.4 TDI engine was introduced for the 3 and 5-door hatchbacks in addition to a 1.6 16v GTI version. The Mark IIIF Polo Classic is still sold in Mexico and Argentina. In Mexico is actually the Derby. Both versions of the Mark III Polo were strong sellers in the united kingdom, never quite a match for market leaders for example the Ford Fiesta and Vauxhall Corsa, but a strong competitor for those who are likes of the Fiat Punto and Nissan Micra. All through its launch, it was subsequently arguably the most efficient small car on sale in Britain when it comes to build quality and "upmarket" feel, a thing that was noticeably absent coming from the likes belonging to the CitroÃ�Â«n Saxo and Peugeot 106. When associated with the Mark III's demise however, many of its competitors had matched in addition as exceeded its standards. The 1.4 TDI was considered the most ideal in a very range for the reliability, fuel consumption, and relative power, for a small engine.